Really interesting to see the recent Mobile consumer survey from Deloitte so I thought I would share it with you. Fascinating to know that 52% of the UK own a smart phone and on average they download 2.2 App’s per month… more for the Tablet owners. 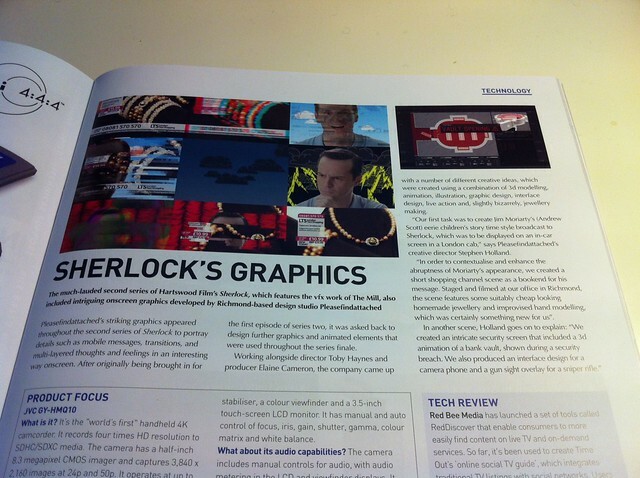 The February issue of Televisual featured a great half page article on the graphics we created for Sherlock 2. Continuing our work for the BBC hit TV drama Sherlock, starring Benedict Cumberbatch, we created motion graphics and animation for the third and final episode of series 2, The Reichenbach Fall. Our first task for this episode was to create Jim Moriarty’s (Andrew Scott) story-time message to Sherlock. Although only a short scene, the process involved creating and compositing a number of elements, from hand drawn to live action footage. Working closely with director Toby Haynes and producer Elaine Cameron, our brief was to create an eerie children’s story-time style broadcast. We created a storybook environment from which Moriarty delivers his taunting message as his world transforms from a sunny day full of fluffy clouds, to a dark and stormy scene as the true meaning of his message becomes clear. In order to contextualise and enhance the abruptness of Moriarty’s appearance, we created a short shopping channel scene as a bookend for his message. Staged and filmed at our design studio here in Richmond, the scene features some suitably cheap looking home-made jewellery and improvised hand modelling. The whole process involved working with green screen live action footage of Andrew Scott, creating illustration and 2d animation and even a spot of set & prop building. The sequence was topped off with a glitchy digital distortion as the shopping channel footage merges with Moriarty’s intercepting message. At a pivotal point in the episode, the Crown Jewels break in, we created an intricate security screen including a 3D animation of the bank vault, seen here when Moriarty breaches the vault security. Additionally we produced an interface design for a camera phone and a gun sight overlay for a sniper rifle. If you would like to find out more about our motion graphics and animation for television please see our site www.pleasefindattached.tv. If you would like to discuss how pleasefindattached could help your production please call Stephen or Nel on 0208 891 4537.